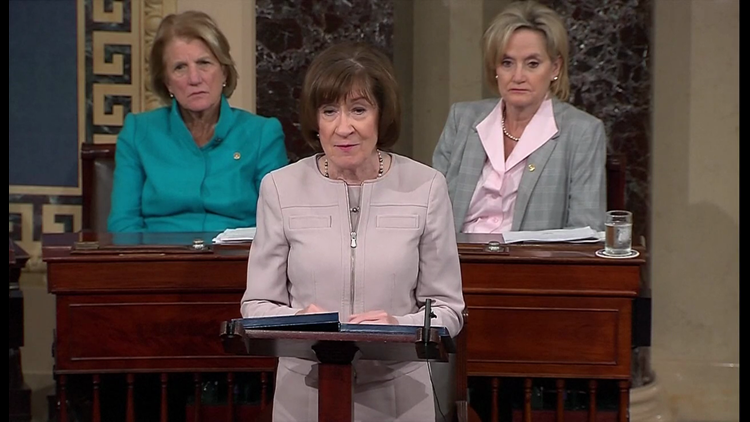 Collins strongly voiced her disapproval of 'dark money' groups during her speech on the Senate floor regarding her decision to confirm Justice Kavanaugh. (NEWS CENTER Maine) -- Senator Susan Collins reiterated her disapproval of special interest groups pouring money into political campaigns and issues Saturday following an advertisement by an advocacy group thanking the senator for her vote to confirm Justice Brett Kavanaugh to the Supreme Court. According to the Portland Press Herald, A conservative group that poured more than $5 million into a campaign to defend Brett Kavanaugh launched a new ad buy this week: thanking Sen. Collins for her vote supporting the nominee. "Senator Collins is against dark money - period. It makes no difference whether it’s used by interest groups to praise her or criticize her. In Maine, we saw nearly double the amount of ads opposing Judge Kavanuagh’s nomination as we saw ads supporting him— that’s what she made reference to in her speech from the Senate floor."